Statistics Now on site 12 persons. This route is fictive, but based on real relief and has enough difficult track profile; route oriented for both passenger and freight transfer. In perspective route should have branching track network with some large stations and large amount of small stations. Also with route delivered 10 scenarios. 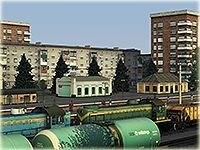 The first version of the route was published December 17, 2011, and previous releases have been downloaded more than 22000 times.